AMD unveiled its first enterprise-centric mobile processor in Mexico City, Mexico alongside HP's launch of the HP EliteBook 705 G3, the first commercial notebook to debut with AMD silicon. The most significant thing about the EliteBook 705 G3 is its slim design. HP claims that the notebook is the world's slimmest and lightest commercial Ultrabook, edging out the even more premium priced HP EliteBook Folio 1020 G1, a notebook that ships with Intel's first generation Core M processor. Unlike the Core M, the AMD A12 Pro on the highest configuration of the EliteBook 705 G3 still uses a fan, and you still see air vents on the plastic undercarriage of the notebook. The 25W processor is more powerful than Intel's 15W architecture on Core M, and it delivers more performance at a more affordable price. The AMD A12 GPU is a quad-core CPU with 8 integrated graphic cores, making it a 12-core design. The AMD A12 Pro APU has the fastest clock speed of any notebook processor, coming in at 3.4GHz. AMD claims that performance benchmarks reveal that the APU outclasses existing Core i5 mobile processors from Intel, so it should readily beat the more power conservative Intel Core M CPU. We'll have to wait to benchmark the A12 Pro against Intel's Skylake-based second generation Core M.
With eight GPU cores, AMD claims that the graphic performance is equivalent to or above a 2000 series FirePro graphics. This means that you're getting discrete-class graphics in an integrated design, according to Vladimir Rozanovich, Corporate Vice President of AMD. Despite packing in so much power, the A12 Pro still delivers all-day battery life, which means over eight hours on a single charge, said Rozanovich. AMD claims that early testing of the A12 Pro on the EliteBook 705 G3 reveals that the processor can deliver over nine hours of battery life. In terms of raw performance benchmarks, the A12 Pro delivers 31% faster graphics, 19% greater CPU performance and 18% greater multi-threaded performance. Additionally, there is also an AMD Secure Processor, which is based on ARM TrustZone, for hardware-based root of trust applications. 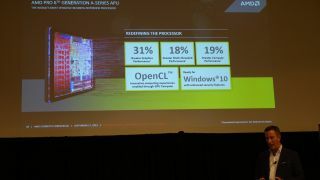 Despite announcing Lenovo as a launch partner for the A12 Pro, AMD says that its latest processor will be an HP exclusive. The exclusive period isn't stipulated in a contract, Rozanovich revealed, but we can expect to see HP as the only A12 Pro vendor for at least six months, given HP's robust portfolio. AMD reveals that HP's historic commitment to AMD, its large mobile portfolio and a dedication to the commercial space makes it a natural partner. For enterprise users, AMD guarantees a 24-month longevity period for its Pro-class processors as well as 18-month longevity. When I asked AMD about positioning the A12 Pro as a mobile workstation product given its powerful Radeon R7 graphics, Rozanovich said that this would be the natural progression, and that HP could certainly re-purpose existing products and re-classify them as mobile workstations. Simply put, it seems like a matter of branding, and if HP chooses to go that route, AMD would get its processors ISV certified. ISV certification would enable IT administrators to confidently choose a product knowing that it has been rigorously tested to deliver consistent performance with popular titles, like Adobe Creative Suite. Rozanovich revealed that the company isn't afraid that more powerful A-series chips, like the A12 Pro, would cannibalize the discrete FirePro business at AMD. It would only add to the interest for discrete graphics, he said. One application that could drive corporate users to graphics is virtual reality. Virtual reality glasses like Oculus or HoloLens could drive the need for even more powerful graphics.